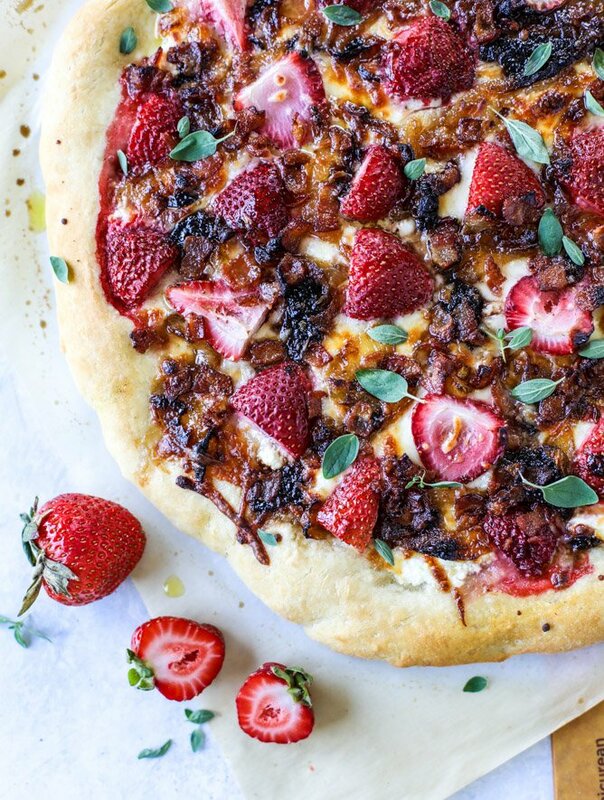 Strawberry Pizza with Bacon and Caramelized Onions. I’m putting strawberries on your pizza and don’t even be mad about it. I know exxxxactly what you are thinking when it comes to this pizza. WELL THAT’S JUST WEIRD. Right? I’m sure weird has crossed your mind, at the least. Probably other interesting words that I could list if I had a thesaurus. But hear me out. I thought the same thing at first too. In fact, in took me a few days to come around. Let me tell you the story! Every year when we come back from northern Michigan, I’m insanely inspired to make a few dishes that I had and this past trip was no different. I almost always recreate something that I’ve eaten at Café Sante. Like, always. We stay in walking distance from the restaurant and in previous years, we’ve eaten a meal there EVERY SINGLE DAY. It’s just so freaking good. SO! That’s what happened again. On our first night there, I saw that there was a strawberry pizza on their specials menu. They feature a produce-special each month and I was super excited we were going in June since 1. I’m obsessed with all things strawberry and 2. It had been over ten years since we were there in June, so I never had their June menu! YES these are the insane things I think about. Anyhoo. I saw that pizza and was like… huh. That’s weird. Like really weird. I don’t think I can do it. Not in the mood. Strawberries in a savory salad, yes, but on my pizza? Meh. Not into in. Um. Well. The moment that we left? I regretted my no-pizza decision. Don’t get me wrong, the meal I had was amazing but I couldn’t get the freaking pizza out of my head. I was obsessed with the idea. To a crazy extent. We didn’t make it back until the end of the week and I got the pizza. It was one of the best, most memorable things I have ever eaten. I was so mad that it was our last night because it meant that I couldn’t take the leftovers. UGH. The flavor was just absolutely insane. It was also almost a fork-and-knife pizza because it was so loaded with ingredients and strawberry balsamic, but once it cooled, the slices were easy to pick up. And that is how this pizza came into my life. The moment I got home it was the first thing on my list to make, and make it I did. AND IT TASTED JUST AS GOOD. I had jotted down the ingredients list on the menu but was afraid some secret thing would be missing from the list. Nope nope nope. Pretty sure we nailed it here. The cheese is mostly ricotta but there is also some mozzarella mixed in. Super creamy and wonderful. There is also bacon on the pizza! Now, bacon and I are having a weird thing this pregnancy. I mean, I’m normally fairly picky about bacon and I want it to be super crispy but at this stage in my life I cannot even begin to stomach slightly uncooked bacon. Like chewy pieces that someone would put on pizza, UNDER the ingredients, so it doesn’t crisp? Oh hell no. Get it away from me. Therefore, I made sure to crisp my bacon up first before it went on the pizza. Lots of flavor! BUT. The best part might be the strawberry balsamic drizzle that I made from scratch so it would be super flavorful. It was SO good. Super briney and tart drizzled over creamy cheese and smoky, crunchy bacon and sweet onions and strawberries. WHAT. It’s a flavor lover’s dream come true! Trussst me. While the dough is rising, heat the bacon in a saucepan over medium-low heat. Cook until semi-crispy and the fat is just rendered, then remove it with a slotted spoon and place it on a paper towel to drain any excess grease. Keep the skillet over low heat and add the sliced onions. Toss well, adding another pinch of salt. Cover and cook until caramelized, stirring occasionally and making sure the onions aren’t burning, for 45 to 60 minutes. Halfway through the caramelization process is when I stir in the garlic. Begin to make your pizza! Cover your dough with the ricotta and mozzarella cheeses. Evenly disperse the halved strawberries, caramelized onions and bacon. You can drizzle a little of the balsamic reduction on now too, but I also like to put it on after. Bake for 20 to 25 minutes (or around 15 to 20 minutes if using the pizza stone) until the cheese is golden and bubbly. Remove from the oven and top with a sprinkle of parmesan, fresh basil and oregano. Devour! Place the chopped strawberries in a food processor or blender and blend until pureed. Heat the strawberries and balsamic vinegar in a saucepan over medium-low heat. Allow the mixture to come to a boil, then immediately reduce to a simmer. Simmer until the mixture reduces by half of the amount – about 8 to 10 minutes. Set it aside and let cool until ready to use. Be sure to watch this carefully so it doesn’t boil over! NOW do you get me?! Boyne City Travel Diary 2017, Part 1. Ok so at first I was like WHAT????? Jess has gone crazy with pregnancy cravings but now I am totally sold and neeeed this pizza!!! The way you describe it makes it sound ridiculously good and I love that you made your own balsamic strawberry glaze! I have so many ideas for that glaze like pancakes or cocktails or cupcakes OMG yes! yes yes that’s how i was at first too! then it was alllll i could think about. I definitely think I can get behind this! Maybe with some goat cheese, too! it would be amazing with goat cheese too! This is the best idea for a non conventional pizza. Great play on savory flavours. This sounds so tasty, and very interesting. I have been thinking a lot about creative ways to use strawberries lately. As they are amazing now, and their potential really isn’t fully used in most cases. Well done. So on board! I’m not really a traditional pizza lover (blasphemy, i know) but I love out there ones. One of the best was roasted strawberries with blue cheese, hazelnuts, and balsamic glaze. Perfection! ahhh dying to have one with blue cheese!! You’ve converted me with your detailed description and incredible photography. Especially with the ricotta! Swoon! I will try this, only because it does look so good and you said so. Please don’t do strawberry pasta, I think that just won’t work for me. bahahah – don’t worry, i won’t go there! So… I’ve never made caramelized onions by “making sure they are burning”…? just a typo! i meant AREN’T burning – i fixed it! Oh, ok :) That makes more sense! Thanks! Very Unusual pizza. Something that I will try, but doing in my 12 inch cast iron skillet. Would that be too much dough for the skillet? i think it will – it would only use half (or even a third if you want it pretty thin!) and freeze the rest! I started out reading this thinking “gross!” but now I want to eat it immediately! that was my exact reaction when i saw it on the menu! This looks amazing and I will try it soon. It does not sound crazy or gross to me. Each summer I pickle fresh cherries and use them for pizzas and pastas. In particular, I have made Bacon Pistachio Pizza with Pickled Cherries which was amazing. I can’t wait to get some fresh strawberries while they are still in season. now that pizza sounds incredible to me, murray! Hmmm, interesting! You sold me with your blueberry pizza a few years ago (that was my gateway to your blog!) so I’d totally be down to try this. so funny – the blueberry pizza was also from the SAME place!! they do blueberries in july and tomatoes in august, and i think they always do a pizza with their monthly pick! Ooooh you went there. And I freakin’ love you for it. I def ain’t mad about it. Whoop! so glad it was a hit bonita! thanks! This is incredible! I can totally see how it works – although I will admit it had never crossed my mind to put strawberries on pizza! Had every intention on making this pizza over the weekend. Even had the pizza dough made and in the refrigerator then a family situation came up; not wanting to leave the pizza dough for too long in the refrigerator; I turned it into a loaf of bread instead and it tasted delicious. I made this for dinner tonight. Very tasty. Looking forward to the leftovers for breakfast tomorrow. We really liked the strawberry balsamic reduction too. There was some left, and my husband suggested it would be really good over vanilla ice cream. So that is what we will be using it for. so glad you liked it jane! thanks! wait, what, huh? Wow, what a recipe! Strawberry balsamic-bacon-ricotta, etc, could never have imagined, so many creativity points for this! Thank you for such a creative recipe! Made this for Sunday dinner and it was PHENOMENAL!!! I haven’t stopped talking about it. Can’t wait to sign up for Sweet Pea! I made this last night and I snagged the leftovers away from my husband so I could eat them for lunch today. This pizza is SO FREAKING GOOD. Hi there! This is Alyssa with the New York picture desk of The Daily Mail Online. We are writing a piece on Strawberry Pizzas and would love to use your images in the feature. May we do so with a link back to your page/ recipe, and full credit to you on the image? Let us know as soon as you can and thanks for your time! !